Slag with high P2O5 content generated during the use of high-P iron ores is an important potential source of phosphate. 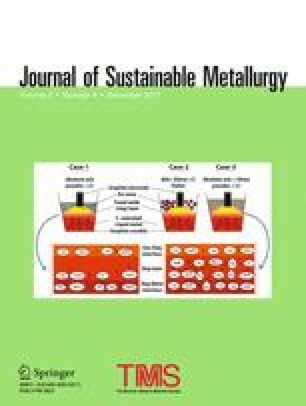 Because the P-rich 2CaO·SiO2–3CaO·P2O5 solid solution in the slag was preferentially dissolved compared with other phases in aqueous solutions, selective leaching of P from slag with high P2O5 content was applied to recover soluble P in this study. To improve dissolution of the P-rich solid solution, the effects of Na2O addition on slag dissolution were investigated under different leaching conditions. The results show that a new 2CaO·SiO2–2CaO·Na2O·P2O5 solid solution was formed in the slag after Na2O was added, resulting in a higher dissolution ratio of P. However, at pH 7, further increase in Na2O content did not promote P dissolution because of phosphate precipitation. At pH 5, a better P dissolution was obtained and its dissolution ratio increased with an increase in Na2O content, indicating that Na2O addition promoted the dissolution of the solid solution from slag. In the citric acid solution, more than 90% of the solid solution was dissolved and the dissolution of the matrix phase was suppressed dramatically by Na2O addition, leading to a low dissolution ratio of Fe. An excellent selective leaching of P from slag was achieved.